We will check the health your Mac Desktop or Server and warn of any issues with backups, hardware failures, and AppleCare expiration. 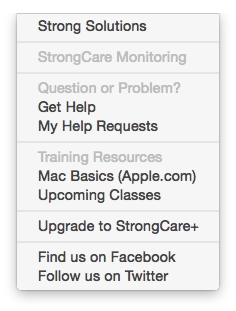 Think of StrongCare HealthCheck as the Check Engine Light for your Mac. It’s easy to install and starts working immediately. It helps us take better care of you! If an issue or question arrises, we also install a handy support menu to request help, see open tickets, and access various resources. Here is a comprehensive list of the items checked on each Mac–additional system health areas are added routinely. It’s easy to deploy and begins working within seconds of installation. Regardless of the age of the Mac, it is highly recommended that you use this software. You won’t regret the investment.